In following along on our adventures in conservation, you may have learned a new term often heard in the lab: concretion. As described in previous entries, concretions can contain a wealth of artifacts, made of many different materials. Corrosion is the driving force behind the development of concretion on iron and the subsequent envelopment of other artifacts nearby. We find a lot of iron on Queen Anne’s Revenge, thus a lot of corrosion, and in turn, a LOT of concretion. Corrosion can be encouraged by the formation of a galvanic cell, which occurs when two artifacts made of different metals are deposited together. For example, a pair of copper alloy dividers resting near an iron tool will encourage corrosion of the iron, as copper is more stable. However, with or without the aid of nobler metals, iron is extremely susceptible to corrosion in marine environments. In some cases, particularly with wrought iron, the metal sacrifices itself entirely during this long, destructive process. Because it is heavily worked during manufacture, wrought iron is even more susceptible to total destruction due to corrosion than cast iron. X-ray helps us detect these “missing” artifacts. Instead of seeing a bright white, definable object, as cast iron appears, these entirely corroded artifacts show up as a faint outline with no metallic iron remaining. The outline represents a cavity where an object once existed which can then be used as a natural mold in recreating the missing artifact. Using the x-ray images as a guide, the concretion is carefully and cleanly broken in a place that will cause the least amount of damage to the cavity or the rest of the concretion. Once broken, the cavity is thoroughly cleaned using dental tools and tap water to flush out the remaining iron residue. Epoxy resin is poured into the cavity and allowed to harden overnight. The following day, the concretion is removed using an air scribe, and we are left with a perfect representation of what the artifact once was. The epoxy is fine enough to not only capture the shape of the artifact, but also maker’s marks and evidence of use-wear. It retains and consolidates the remaining outer surface of the artifact, ensuring the epoxy version looks just like the real thing. A perfect example of this process is QAR3457.001, a file likely used for woodworking. Not only did the epoxy resurrect the shape of the blade of the file, but each surviving little striation of the file’s teeth are visible in all four of its surfaces. Fortunately, the wooden handle also survived. As a conservator, the casting process is my personal favorite, because it perfectly demonstrates the ability to resurrect an otherwise lost artifact. It not only requires patience and care, but allows us to flex our creativity muscles in envisioning the abstract: thinking inside the artifact to understand how to bring it back to life. -Cronyn, J.M. The Elements of Archaeological Conservation. London: Routledge, 1990. -Concretion from the Queen Anne's Revenge shipwreck, courtesy NC Department of Natural and Cultural Resources. 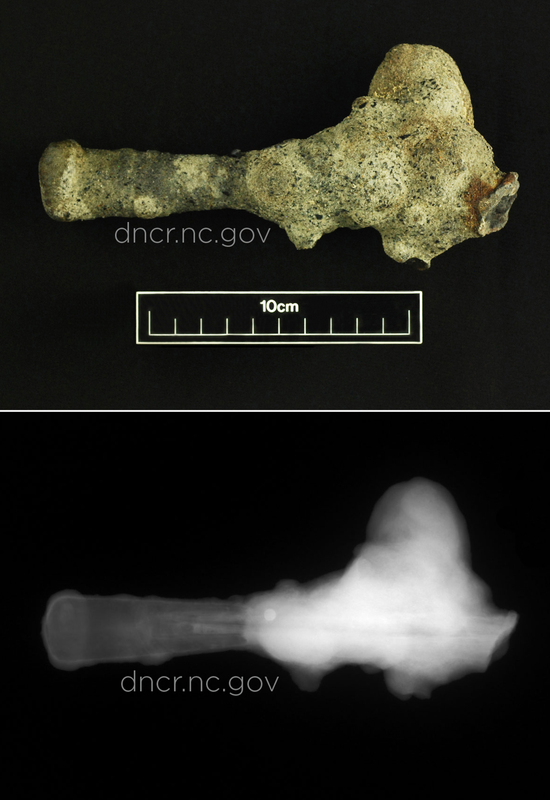 -X-ray of concretion from Queen Anne's Revenge shipwreck, courtesy NC Department of Natural and Cultural Resources. -Conserved file from the Queen Anne's Revenge shipwreck, courtesy NC Department of Natural and Cultural Resources.